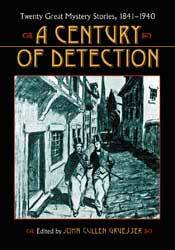 This valuable anthology should find a ready audience amongst both general readers and students of crime and detective fiction. It combines a selection of classic examples of the genre (by Poe, Doyle, Chesterton and Susan Glaspell) with “pivotal works by lesser-known authors, and unknown gems by major writers not typically associated with the genre” – for example, Wilkie Collins, Mark Twain, Bret Harte, Mary Wilkins Freeman, Anna Katharine Green, Carroll John Daly, Dashiell Hammett, Cornell Woolrich, Pauline Hopkins, Chester Himes, and Ralph Ellison. Gruesser organises his selections into six roughly chronological, thematic categories, intended to showcase the ways in which the genre was varied and transformed in the hundred year period from 1840 to 1940: “The Invention of Modern Detection” in the work of Poe; “Variations on Poe, Expansions to the Form” in the work of Collins, Twain and Chesterton; “The World’s Most Celebrated Detective”, which includes three Doyle stories and Bret Harte’s parody of Sherlock Holmes; “Gender, Sexuality, and Detection” in the work of Mary Wilkins Freeman, Baroness Orczy, Anna Katharine Green and Susan Glaspell; “Tough Guys,” represented by Carroll John Daly, Dashiell Hammett and Cornell Woolrich; and “Race and Detection”, with stories by Pauline Elizabeth Hopkins, Chester Himes and Ralph Ellison. An extract from “The Birthmark”, an Ellison story not previously reprinted, is included below. Detective fiction has significance not simply on account of its popularity but also because it has evolved as modern society has evolved. Despite its association in many people’s minds with British authors, manners, and settings, writers from the United States pioneered its two major varieties–the classic or analytical story, invented by Edgar Allan Poe in the 1840s, and hard-boiled fiction, which began to appear in the early 1920s. The wide range of directions in which authors have taken detection serves to substantiate Raymond Chandler’s contention that it is a “fluid” form that defies “easy classification.” No doubt Poe, who craved but never achieved sustained popular success as a fiction writer, would have been surprised to discover that in the second half of the 1800s the genre he launched would reappear in action-packed dime novels featuring protagonists such as the Old Sleuth, New York Detective, and Nick Carter, as well as in several books about the exploits of America’s most famous detective agency (well known for its trademark open eye, the eye that never sleeps), supposedly written by Allan Pinkerton himself. He would certainly be shocked to learn that two generations after his death white women and African Americans would embrace detection as a means of addressing social and political issues of particular concern to themselves. Moreover, he would likely be amazed to find that over the last 160 years the descendants of his aristocratic French detective have come in an array of shapes, sizes, nationalities, genders, socio-economic classes, sexual orientations, political points of view, and ethnic and racial backgrounds. One of the most interesting stories in the collection is Ralph Ellison’s “The Birthmark”, an extract from which is reprinted here with the kind permission of the Ralph and Fanny Ellison Charitable Fund. The summer heat struck them in a wave as they stepped from the car into the highway. Matt and Clara stood quietly, watching the highway patrolman pull his huge body from beneath the steering wheel. Matt turned and saw the other white man, the coroner, looking out across the green stretch of field fringed with pine trees, where two large birds circled slowly, black shapes against the still, blue air. “Them damned buzzards,” the white man said. “Well, let’s git going,” the patrolman said. He looked at Clara; maybe now she would go back, this was nothing for a woman to see. “Yeah Clara, you better go on back. If it’s Willie I’ll tell you,” he said. He watched her face set resolutely as she wiped sweat from her forehead. Sun gleamed on her straightened hair. Matt knew she would refuse before she spoke. The white men exchanged glances as Matt tried gently to push her away. She stood her ground. Matt swallowed hard and dropped his arm from her shoulders. It was no use, nothing could make Clare leave. The patrolman hitched his brass-studded gun belt and grunted as he led the way. They went down and embankment into the bushes. As he went thought, Matt caught a glimpse of the body. Drawing closer, he saw it was covered with newspapers. It lay in a clearing beneath the trees, upon the pine needle covered ground. “Lord, don’t let it be Willie, Lord,” Matt thought…..